Against a backdrop of numerous layers of Songaksan sits the city of Kaesong in North Hwanghae Province, North Korea. Kaesong industrial complex lies not far away from the city. The sun has already set but it still casts dim light above the mountains, and the city looks calm. Such is the evening scene that artist Yoo Soo has captured through his lens. Although it has gone through political turmoil, the city looks like any other city, when viewed without ideological barriers. At Culture Station Seoul 284, 10 artists and artist groups are showing works that look at Kaesong, an inter-Korean border city where many controversies and political tensions have played out over more than a decade. Instead of dealing with ideology or politics surrounding the city, the “Kaesong Industrial Complex” exhibition focuses on things surrounding the city and symbols of inter-Korean cooperation. “The exhibition started to take shape as we asked ourselves how much we knew about what actually happened in Kaesong, the place where people from two Koreas lived together for around 10 years,” curator Park Ca-rey said during a press conference last Friday. Established in 2002, Kaesong industrial complex was a joint industrial park where the South supplied capital and infrastructure, and the North provided skilled labor. It was hailed as a stepping stone in inter-Korean cooperation but was shut down in 2016 by the Park Geun-hye administration as the North pursued nuclear and missile programs. “We thought the series of processes, in which the once militarized zone became an industrial zone, was actually an art-making process,” Park said. 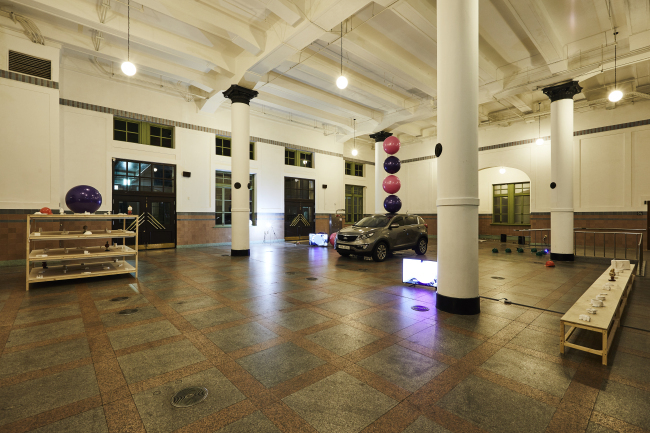 Among the many works on display at the old Seoul Station is artist Yang A-chi’s “Pyongyang, 30 mins, Seoul,” a set of installation works based on the 30-minute time difference that came into effect between the two Koreas after North Korea adopted the Pyongyang Standard Time in 2015. In May this year, Pyongyang reverted to the Korea Standard Time following North Korean leader Kim Jong-un’s pledge to unify the standard time at the first summit between South Korean President Moon Jae-in and Kim on April 27. There are also works that capture the daily grind of Kaesong citizens. Artist Yoo Soo’s “Workers from the South in GIC” is a series of photos of North Koreans who worked in Kaesong, while Kim Bong-hak Production’s “Project Ari” comprises a documentary video and photos that show the daily life of Kim Bong-hak, a craftsman who created hand-made football shoes. Project Ari was the first-ever trilateral economic project between China, North Korea and South Korea. Painted in traditional ink on white chiffon, Jeong Jeon-yeop’s “Going to Work Fully” is an artistic representation of the female workers at Kaesong industrial park. 2015 Venice Biennale Silver Lion award winner Im Heung-soon’s two-channel video installation work “Brothers Peak” embodies South Korean businessmen’s yearslong hope for the reopening of the industrial complex as they bear financial losses from the closure of the site. 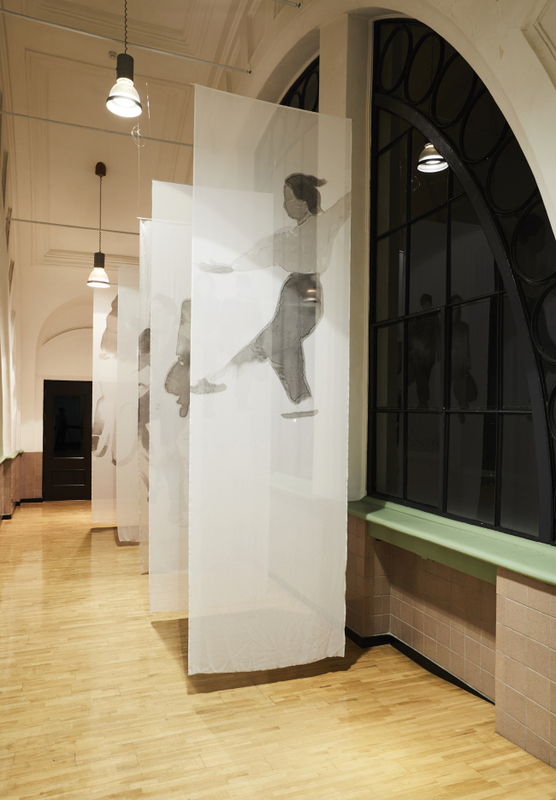 Standing back-to-back and splitting the exhibition space into two, the work represents the division of the two Koreas, accompanied by music longing for reunification. “It is quite a shame that we did not have much access to the Kaesong Industrial Complex and could not actually listen to North Korean people’s take on the industrial complex since it could be biased,” Im said, expressing hopes to visit North Korea and collaborate with people there. The exhibition runs through Sept. 2.